Imagine growing Potatoes in a container. 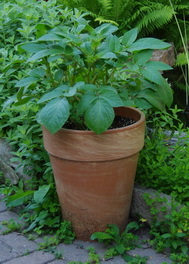 I have to admit that I was sceptical at first but when I found this lovely large terra cotta pot, (35cm by 45cm tall) I thought it might be the perfect Potato Pot. I was amazed at the results. Not only was it a rather attractive container all summer but it also produced an amazing yield of Potatoes. It was a lot easier than the usual digging, hoeing and hilling that is required to grow those same Potatoes in the garden. What Do I Need? A large container, preferably quite deep, some good container soil and some pieces of potato. 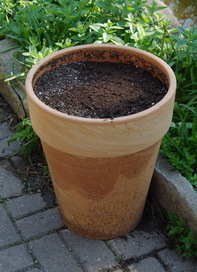 I used some of the newer soil mixes that are formulated for outdoor containers. They are heavier than regular soilless mixes due to the addition of some compost etc that will retain moisture and provide a base of nutrients. What’s A Seed Potato? 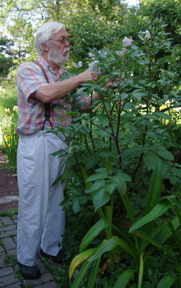 You will find references to seed potatoes in gardening books and articles. There is nothing magical about them. Any potato, that has not been treated to prevent sprouting, will work. Most seed potatoes have been grown on farms that are very carefully monitored for any diseases etc so that the pieces you plant are certified virus free. It really is just a hunk of Potato with a couple of eyes on it. Those eyes grow into the new plants. What Do I Do? Fill the container about 2/3 with the soil mix and then insert the potato pieces, I used three pieces in my 35 cm pot, so that they are nicely covered by the soil. Water!!! As the plants start to grow continue to add additional soil to the potato pot covering up about half the stems of the emerging plants but leaving the leaves at the top out in the sunlight. After a few weeks of this the pot will be almost filled with soil. Do not fill it up to the top rim or you will find it very difficult to apply any amount of water. Water regularly all summer and fertilize it with a good water soluble fertilizer about every 2 weeks. As the plants get bigger the frequency of watering will noticeably increase. How Much Do They Grow? Mine were in excess of 150 cm (5ft) tall by mid summer and were throwing a nice selection of purple flowers for a few weeks. The flowers are a bonus and not showy enough to justify growing them just for the floral display. By mid September the plants start to look a little sad. They will eventually die down completely and then you may harvest your crop. Harvest? 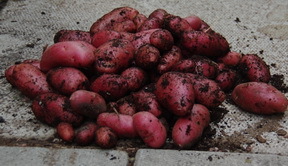 The three small pieces of Potato that I put into the potato pot yielded a significant pile of delicious tubers. I’m guesstimating about 6 - 7 kg (13 - 15 lbs.) I was amazed. Secrets? Almost any type of Potato would probably work but I think part of my success was the use of the French Fingerling variety. It produces several smaller tubers rather then one or two larger ones. They are also delicious. Keeping them well watered is also one of the keys to success. A Potato patch on your balcony; what could be better. You can now search my entire Gardening-Enjoyed site for answers to your gardening questions and sign up for my free newsletter. Its readers get to send me questions directly.